Renewal “High Raw” is a simple whole foods cleanse for women on the go with work, life and family. For info and sign up, click here! Sign up here to join the fun! 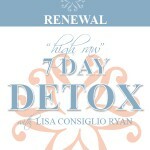 Win Winter Renewal 10 Day Detox! Question: Are these new/different recipes from the Winter and Spring menus? I try to eat fresh and local, so I am curious about the seasonability (is that a word?) of ingredients in this one. Thanks! 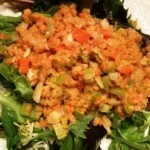 Yes, the recipes are seasonal to summer for Raw Renewal! :) Yay!